PAF is the classic power amp front-end used by London Power in all of its amps, and in hifi amps since the 1940s. A standard 9-pin dual-triode of the 12A_7 type provides an input stage and a concertina splitter. For push-pull, PAF will produce the highest, cleanest output with 12AT7 - or use a 12AX7 for a British feel. The input stage accommodates negative feedback, and for guitar applications also allows for a 'presence' control and various positions for rmaster volumes. PAF can be used as the front-end for a single-ended (SE) amp with the concertina stage used as a buffer to drive parallel output tubes. 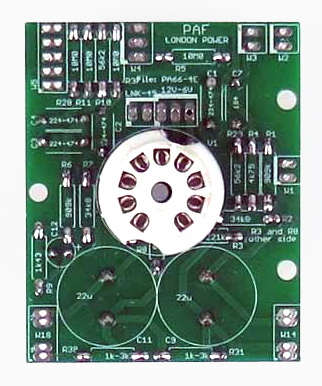 Combine PAF with PX66-COMP Power Expander card or with hand-wired power tube sockets. PAF can be used as the "preamp" for a Champ-style amp with the concertina stage wired for gain instead. PAF's stages can be used independently wired as the front-end of a stereo SE amplifier. The board is silk-screened on both sides allowing "reversible" construction. This accommodates internal tubes with the tubes and components on the same side of the PCB, or external tubes where the tube and components are on opposite sides of the board. Note that the combination of PAF + PX66-COMP is the PA66 - the latter are the same PCB but with different wiring notes. Power requirements: 160-450Vdc at 3mA, plus 6V - 300mA or 12V - 150mA AC or DC.